Whether you are looking for some minor repair work, need to buy a few parts, or are looking for major crash damage repair, we can help you. We specialize in repair and sale of parts for motorcycles (both on road as well as dirt bikes) and ATV/SXSs. Contact us today! Wow a shop that really does what they say! WORK WAS DONE PERFECTLY ! ... great services and great prices! HELPFUL AND VERY KNOWLEDGEABLE ! 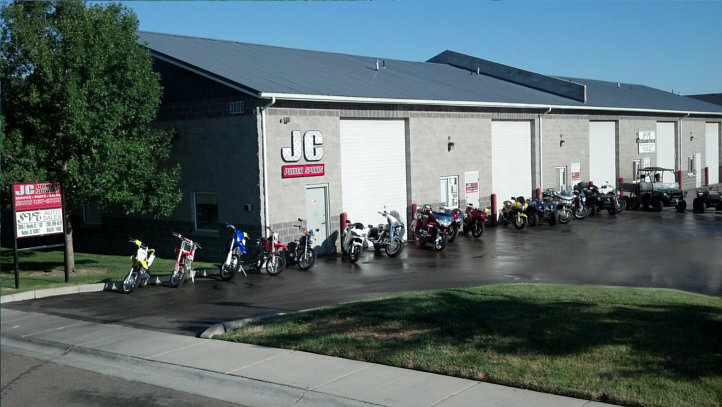 I have purchased my last couple of motorcycles from JC. I have had JC Power Sports add numerous accessories to both my Yamaha V-Star and Kawasaki ATV as well as service and repair. JC Power Sports has a helpful and very knowledgeable staff. I have recommended them to friends with the same great results. For fair prices and good service see JC Power Sports. This is the best shop that I've come across for my Yamaha. Jerry is a wealth of information, and always takes time to answer any questions that I might have. Try them out you wont be sorry. Saves me time and money! The best motocycle shop in the valley. Dustin Berner 10 months ago The best motorcycle shop in the valley. The owner has given me discounts and none stop amazing service in every way. Great mechanic and ALWAYS willing to help me out. These guys will fix you're ride and you'll leave very satisfied. And it's clean when you pick it up! THESE GUYS ARE GREAT !! Travis Walthall 12/23/16 Very helpful and knowledgeable. Thank you!! Christopher Mapes 12/09/16 Outstanding Experience. Jerry will not only treat your ride well, he takes the time to explain the repair plan, cost and completion.....he'll treat YOU well! Great service and fair price! D.j. Adams · December 14, 2016Was a great experience bringing my quad to their shop. Very knowledgeable, helpful, and fair. They only fix what needs to be fixed. Highly recommend them for all of you powers ports needs as wells as supplies. ABSOLUTELY THE BEST CUSTOMER SERVICE ! WHAT A REFRESHING EXPERIENCE, CAN'T PRAISE YOU HIGHLY ENOUGH ! Derrick Bird Very amazing experience. They did a very good job on my bike at a very good price. The mechanics are very knowledge able. They walked me through the bike and even went above and beyond in fixing some issues I didn't know were there. I will be going back for all my future fixes, maybe even some of their apparel. Not only are they highly professional, they were extremely through in understanding what the problem was, and addressing it promptly, my quad had been down for years and in less than 24 hrs I was riding it again, and it runs PERFECTLY! They have definitely earned my business. Definitely taking my bike here from now on. Heard about this place from a buddy at work. Took my bike in for an upgrade and servicing. Got it back on half the time they said it would take and my bike runs better than before. THANK YOU!! You guys were life savers, made it back to Salem, Oregon safe and sound. Thank you for working my Volcan in and fixing the tire balance issue, those beads are fantastic. Your shop was busy and you could have easily turned us away but didn't, for that I am very grateful. Rode a total of 1700 miles and thanks to you my return trip was much nicer. Jeff Bailey08-2017I have been using Jerry and his team for both my 2004 and 2009 Polaris for several years. They provide great service and excellent quality at a fair price. Wouldn't go anyplace else. Took my bike in because it was leaking gas and I assumed the worst. Not only did JC quote me less than anyone in the valley. They discovered the problem was much smaller than I had thought in the first place. Everyone at JC was extremely nice and helpful, will absolutely come back again in the future! You couldn't ask for a better experience! Had them go through my CRF450R before I started riding again this spring. Great Service! Great price (in my opinion). Personal, professional. You couldn't ask for a better experience. I'll be back for all my service needs. Have been meaning to do this for some time because in this case good- or I mean great- memorable experiences stick with you. I contacted Rich in September of 2017 and talked with him extensively about purchasing some aftermarket bottom half doors for my Polaris Razr. He told me would do some research and let me know what he found. Rich called me back in less than 2 days. Gave me a number of choices to pick from and helped me decide based on his experience. I chose one to be my best choice. He said he hadn't done these doors before but would give it his best shot and I went with them. I was very pleased with the doors when I got them. Rich said he had to make a few adjustments to get them to fit right. They are perfect ! I will do all my future business with these guys. They are awesome! Thanks Rich! and thanks to everyone at JC Power Sports! THANK YOU !! You guys were life savers, made it back to Salem, Oregon safe and sound. Thank you for working my Volcan in and fixing the tire balance issue, those beads are fantastic. Your shop was busy and you could have easily turned us away but didn't, for that I am very grateful. Rode a total of 1700 miles and thanks to you my return trip was much nicer. You guys did an amazing job on Kristis bike chain it sounds and runs with alot more sound and performance now that there is no slop in the chain anymore. ABSOLUTELY THE BEST CUSTOMER SERVICE AND SHOP EVER !! Was a great experience bringing my quad to their shop. Very knowledgeable, helpful, and fair. They only fix what needs to be fixed. Highly recommend them for all of you powers ports needs as wells as supplies. A big thank you !!! To you Jerry and the folks at Jc Power Sports. I love my new additions to my bike. It sounds great!, it looks great! and it runs like a crazy ex-girlfriend..lol. I appreciate everything you have done as well as your unmatched attention to detail. I would never go anywhere else for my bike needs and will tell my friends the same.